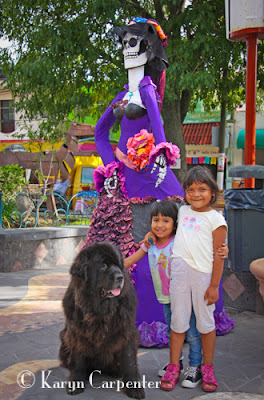 Arayo with her new Mexican amigos! They stare at you from all directions. Bleached skulls, teeth intact. Soulless voids, once filled with seeing eyes. Dressed in finery - a skeletal bride and groom. An extravagant damsel ready for a ball. Another adorned in the most beautiful of hats with matching flowing long dress, as though the queen were about to pay a visit. 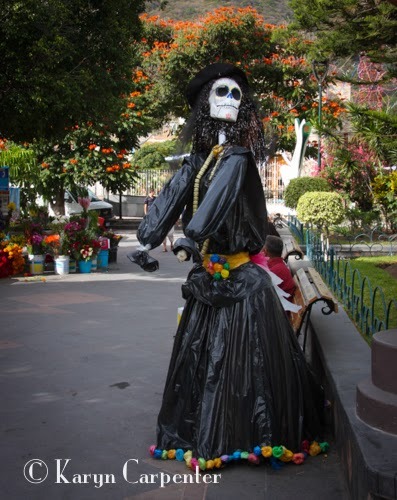 Throughout the Ajijic community square and along the walk by the lakeside, the skeletons pose, holding court over the Day of the Dead festivities. Silently, they watch as the living ride their bikes, stroll with their children, dance, eat and play. For all their finery, no longer can they participate in these earthly endeavors. They are Catrinas, designed and decorated by area artists, groups and schools. Most are made of recycled materials. Look closely at the elegant dress or the flowers the woman is holding and you will see that they may be made of pop bottles which are cut, shaped and painted. Old trash bags are stuffed and combined to form a puffy black skirt. Small shells become teeth. Fishing nets, a mop of hair. Originally created 100 years ago by Mexican artist Jose Guadalupe Posada, the skeleton in her elegantly dressed attire satirizes the life of the upper classes. The art is a reminder that no matter what one may have in this life, death will, indeed, find you, too. Well done! I love the picture of Miz A and her new friends. Karyn, Amy and I are visiting Parsons and Mom and Dad. We've been reading your blog posts about your trip and catching up a bit on your adventures. Thanks for your wonderful photos and blog posts. Hi Karyn, Amy and I are in Parsons visiting Mom and Dad. We just spent the past hour reading and catching up on your adventures by reading your blog. Great photos and fascinating stories from Mexico.